A joyous night and a bunch of dessert lovers sitting around the table. The table is laced with a bowl of Paneer Gulab Jamun. Dark, gooey, sticky, soft, dunked in warm sugar syrup. The fine china is arranged along with the dessert spoons. The creamer is centred on the table filled with extra sugar syrup to drizzle over the Paneer Gulab Jamun. Somewhere in the kitchen more Gulab Jamuns are sitting, waiting for their turn to get dressed in the sweet liquid. The gathering at the table is bathed in the warmth of quiet gratitude. Does this sound like your family’s post-dinner dessert moment? For us, it surely does. 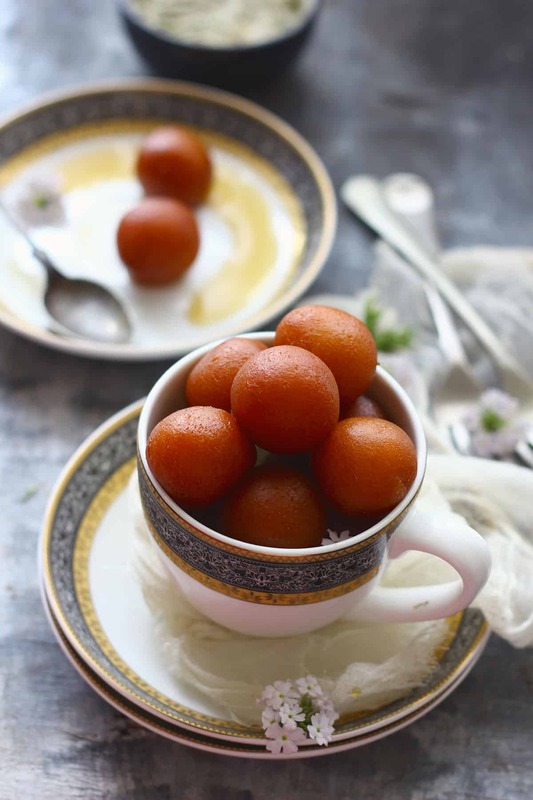 Especially when we talk about favourite Indian sweets such as – Gulab Jamun. 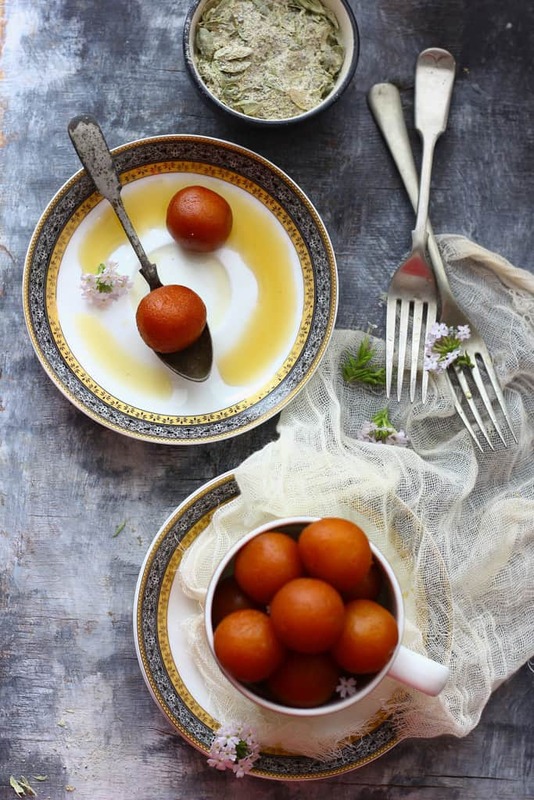 These are no regular Gulab Jamuns (see recipe here), inspired from popular Bengali sweet Chanar Jalebi, these are prepared from homemade paneer (cottage cheese). 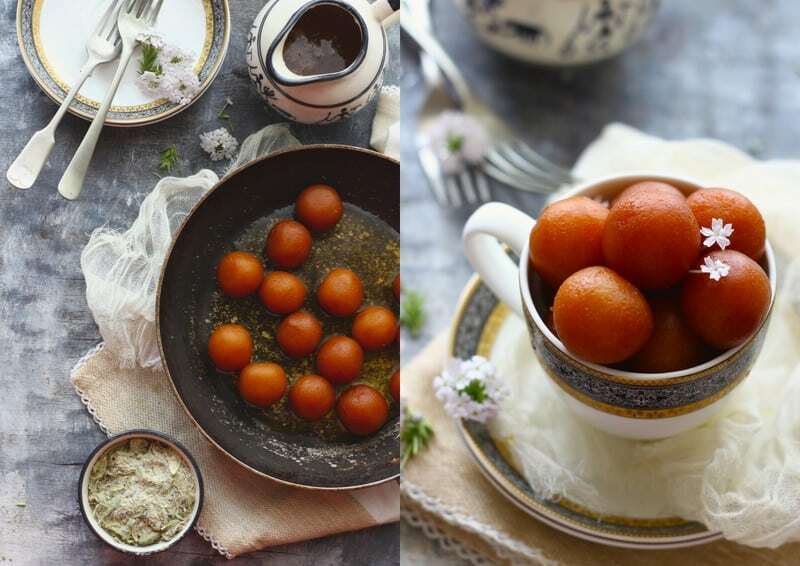 The keynote of any festive occasion is focused on getting these Paneer Gulab Jamuns perfect. They have to be perfectly round, even-size, fluffy, mouth melting and so on. Say for that matter, any dessert served for the large gathering has to be perfect. If a single piece of Gulab Jamun is not up to the expectation, someone at the table will remind you. It will be your rude aunt, maybe. That is why aunts exist, right? So much relies on this final perfect dish. After all, the meal ends with it, and the last note is always the most important at a communal gathering. The paneer aka cottage cheese has to be churned from scratch at home, turned into a workable dough and later transformed into luscious Paneer Gulab Jamun. On certain occasions, when we are in a mood to keep check of calorie consumption we coat these Paneer Gulab Jamuns in honey syrup. A cup of honey diluted with little water and that’s it. This honey syrup makes Paneer Gulab Jamun less guilty pleasure. Or as some might say— bearable. You can find more such interesting Indian Desserts similar to Paneer Gulab Jamun on our Pinterest Board. 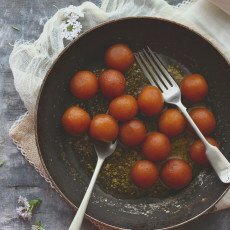 Have you ever tried Paneer Gulab Jamun? If not, then this could be your dessert for the festive season. 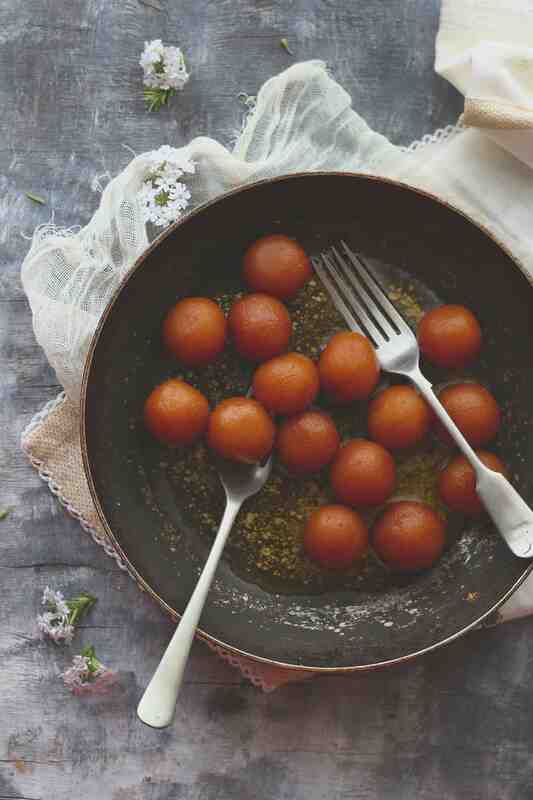 Find how to make paneer Gulab Jamun. Once the milk comes to a roaring boil. reduce the heat to medium and add lemon juice. Stir until the milk starts to curdle. We are looking for the stage when whey water and paneer/chenna gets separated in the milk. Turn off the heat. Line a broad colander with muslin or cheese cloth. Strain the paneer over the cheese cloth and wash it with the water to remove lemon pits. Now tie the paneer tightly in the muslin cloth and hook it at some high point to drain excess water from it. Usually kitchen sink tap is the ideal spot for the purpose. Set aside for 30 minutes to 1 hour. 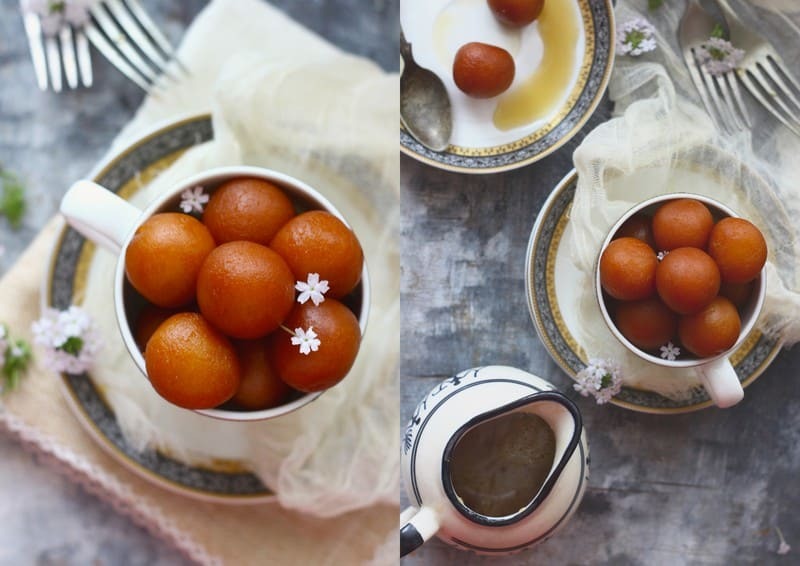 To make gulab jamun, combine together chenna, milk powder, flour, cardamom powder and baking powder in a mixing bowl. Combine all the ingredients and knead to form a smooth dough. Set aside covered for 30 minutes. For the sugar syrup, boil the sugar, water and cardamom pods in a heavy bottomed sauce pan, and stir continuously till it becomes sticky of once string consistency. Once done, take it off the heat and keep aside. Next, shape the paneer dough into round lemon sized balls. While doing this, place a raisin inside each one of them. Preheat the ghee for deep frying. Add a few paneer balls at a time and deep fry Gulab Jamun in hot oil for a few minutes on medium heat turning them over so that they are lightly browned on both sides. Once all the jamuns are done, transfer them to a plate lined with an oil absorbent paper. Finally, add the Gulab Jamun to the warm sugar syrup. Allow them to rest for about 2 hours in the syrup to absorb all the flavour of the sugar syrup. Serve Paneer Gulab Jamun warm.